So I’m switching things up here (because it’s my blog and I’ll write what I want to!) and talking about our choice to use cloth diapers with B. Also I’m bringing back the Tuesday tips- woo! I consider myself a sort-of “crunchy” mom- I try to buy organic/natural/local food and personal care items when I can for our family, but they don’t make up 100% of what I buy. It’s all about balance for our family, which works best. However, cloth diapers were something I’d always wanted to do- the benefits are almost too many to list- not only do they prevent waste accumulation in landfills, they are chemical free, cost effective (after an upfront cost), keep blowouts to a minimum (I am almost certain we have never had an all out poop blowout- we’ve come close, but the cloth definitely keeps things contained better), keep diaper rashes to a minimum and are just cuter that disposables! To start this post off with 100% honesty, we do not cloth diaper B all of the time. 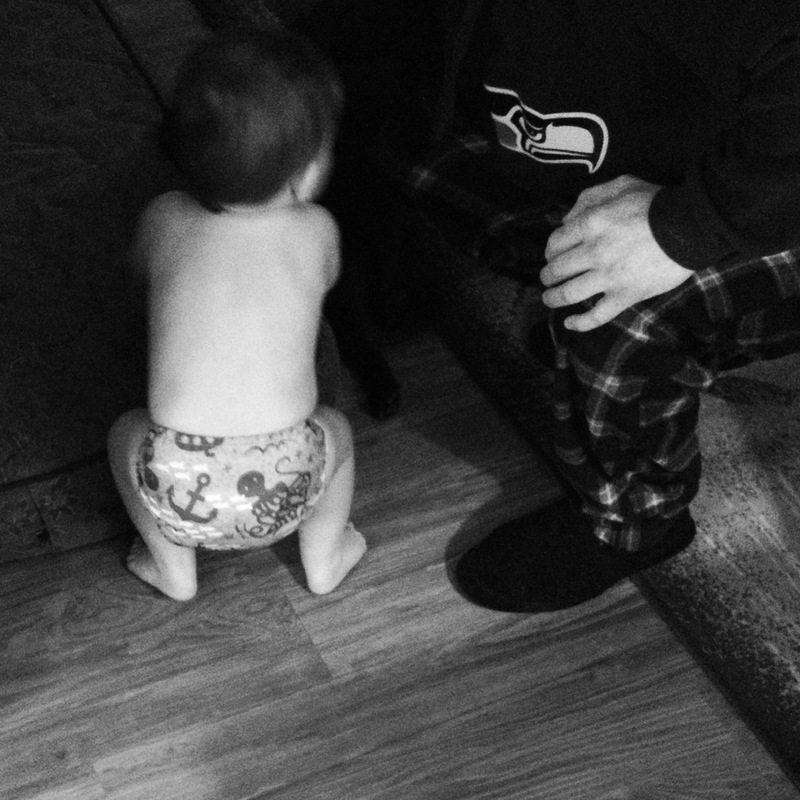 He wears 1 disposable diaper a day- at night- because by the time I got a cloth diaper on that boy that was thick enough to absorb everything, he could barely move his legs. I did not want to spend $$$ trying to find the perfect combination of fabrics to absorb everything, not to mention we were already up to our ears in trial and error with the dairy/soy intolerance. So because I like my sleep, $$ and a dry baby, we put a disposable on at night- and everyone was happy. That being said, we do use cloth the rest of the time. We were super lucky when B was born because my parents gifted us a year’s worth of diaper service which was AWESOME. No having to wash diapers ourselves? Yes please and thank you very much. Not that washing diapers is difficult, but it was just one less thing to think about- toss the diaper in the pail and every thursday set the dirty diapers on the porch where they are magically replaced by a stack of clean ones. Diaper service in our area costs around $50-60 a month- that’s for ~60 diapers a week. We started off with 80 diapers a week when B was tiny and then scaled back once the diaper changes slowed down. $50 a month is fairly comparable to what you would spend on disposable diapers in a month, especially in the beginning (10 diapers a day x 30 days in a month = 300 diapers, depending on what brand you purchase and where you purchase them from you may spend slightly more or less than $50-60). 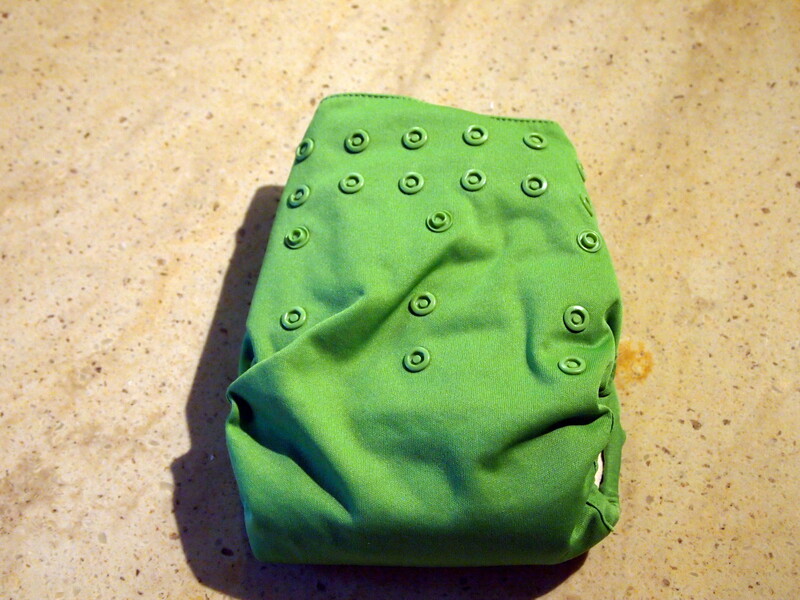 There are a LOT of different ways to cloth diaper now- you can do prefolds with a cover, all in ones, pocket diapers, etc etc. When I was first researching cloth diapers, my head was spinning from all the different choices available to new moms. For us though, the choice was easier since our diaper service only provided prefold diapers. Prefolds are a piece of cotton fabric that is divided into 3 sections. The middle section is thicker than the outer two sections for absorbancy. Obviously (or maybe not so obviously) wearing just the prefold does not keep clothes/you/furniture/etc dry- you need to cover it with something. That’s where the diaper cover comes in. When I was little I remember the plastic pull on pants that my mom would put on myself/my sister- nowadays the diaper covers are WAY cuter. And adjustable! 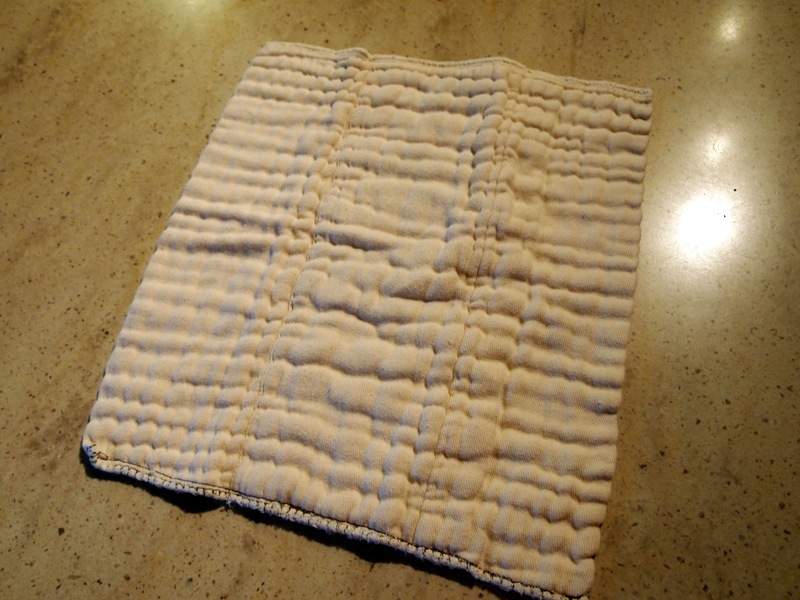 This is a prefold- when you get them they are much more flat and thin but they fluff up the more you wash them. It’s recommended you wash them at least 3 times prior to using them to “prep” them so they are super absorbant. These are a couple of our Flip covers. See!! Super cute! No plastic pull up pants here! Since we were starting out with prefolds, I purchased Flip covers (the company who makes Flip also makes the popular all in one diaper brand BumGenius). I liked the style of the cover and the fact that it adjusted all the way to 35+lbs with snaps. I purchased 9 covers, which I figured was more than enough. 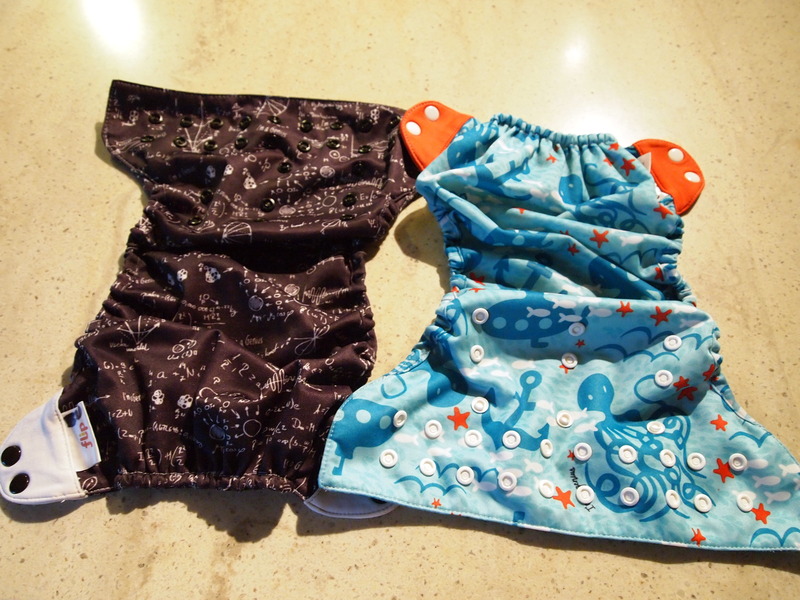 Because the cover is made of PUL (polyurethane laminted) fabric it is waterproof and so you can just remove the wet prefold from the diaper and add a new prefold to the cover (we changed the entire thing if the cover got dirty from poop). This system worked fine when I was staying at home with B- there is a little flap in the front of the cover that keeps the prefold in place on the Flip covers that would get damp over time, so we’d just rotate covers throughout the day. Then he started daycare- and this system didn’t work as well because the cover wouldn’t get changed as frequently, which caused him to develop a rash. After that we started pre-making our covers- basically we fold the prefold and put it inside the cover. Each time he gets a diaper change at school, he gets a new pre-made prefold/cover combination. For this reason I purchased a few more covers- we now have 14 covers. Which means we have enough for 2 days worth of diapering (B uses 5-7 diapers a day now, not including nighttime). Then…summer time rolled around and suddenly B developed a very persistent rash. One that would not go away no matter what I did. Thanks to the suggestion of a friend, we finally figured out it was heat rash due to the warm wet cotton against his skin. We added a fleece liner (literally a strip of fleece cut out of an old blanket) and the rash was gone!! These fleece liners are great too if we do have to apply some cream to his diaper area- they protect the actual diaper from the cream (which can stop the diaper from being absorbent). 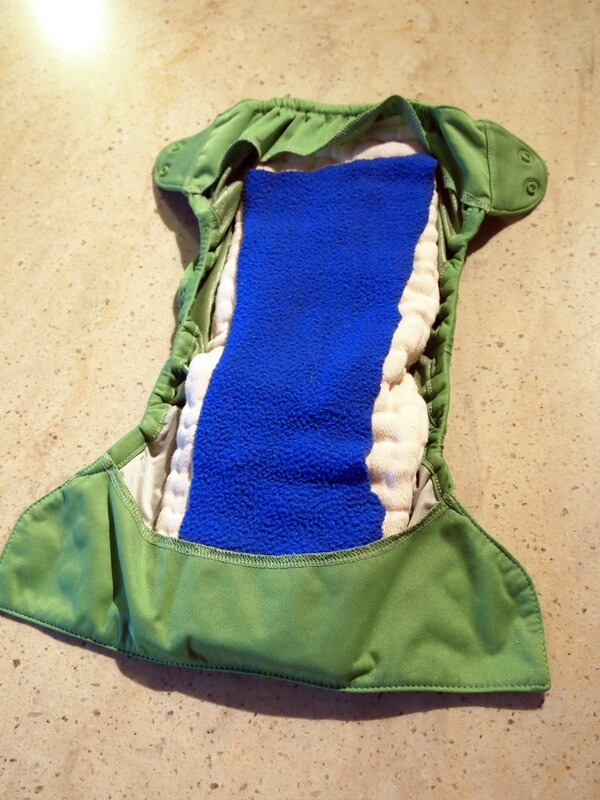 Here’s a fleece lined diaper- you can see the fleece doesn’t even fully cover the prefold (and isn’t even cut straight- ha! ), but it does the job just fine! Now that we’re “cloth diaper experts”- hahaha- I decided to stop our diaper service and purchase our own prefolds. We do a load of laundry daily anyway, so adding some diapers to that is no big deal, and since B is eating solids the poop is much easier to deal with. We use Ecos laundry detergent and just toss in some vinegar (for fabric softening) OR baking soda (for odor removal)- don’t add both vinegar and baking soda though! I purchased the longer prefolds because B is big (*cough* 29lbs at his last dr visit *cough* wearing 2T/3T at 16mo *cough*)- this size would not fit an infant well. To diaper a newborn/infant I would purchase the infant sized prefolds (which is the size we were getting from our diaper service), probably 24-36 of them, so that would be a $36-52 investment. And if B is still in diapers when hypothetical baby 2 is on the scene, then we would of course need more covers. Overall this system works great for us, and I’m really enjoying cloth diapering!! Plus there is just nothing better than a baby running around in a fluffy cloth diaper, don’t you think? Do you cloth diaper? What’s your favorite type of diaper to use? Let me just start off by saying, remember folks- you’re raising a little human, not a robot. Every person is different, and your little person is not going to sleep the same every. single. night. no matter what you do. Just like adults don’t sleep the same every night. It helps to remember this, when you’re trying to figure out why baby is crying in the middle of the night, or waking up an hour earlier one morning, or having a hard time going to sleep. I make sure I’m very consistent when it comes to this- I don’t want to send mixed messages by going in and saying “good morning” but then trying to get him back to sleep. Or doing the routine and then thinking “oh you’re not tired- ok time to get up!” Once I make the decision to put him back in the crib for more sleep, I have to commit to that. 2. Wait 10-15 minutes before responding to baby. Back when B was brand new, I used to wake up at a mere change in his breathing- and try to attend to his needs prior to him waking up fully. Which was great- except I was exhausted. Then I tried giving him 10 minutes, just to see if he really needed me. 9 times out of 10? He was back asleep in less than that. We went from waking up 3-4 times a night to 1-2 times within a week. The only times I break this rule is if he’s frantically crying OR sick. Like the one time he managed to get his leg stuck in the crib slats- even though he had breathable bumpers on- I ran in there as fast as I could. When we had B, I had no idea how often he was supposed to sleep, or how many naps he should be taking in a day. Looking back now, that poor kid must have been exhausted all. the. time. You’d think I could have read a sleep book or two prior to having him, but apparently I was too much of a scatterbrained preggo lady to think of that. After awhile, we got our routine down, and I was able to figure out how long he could be awake before needing a nap. This changes as they grow older- in the beginning he needed 4 naps a day (especially since he went through a 30-45min nap phase) and now he’s down to 1 nap a day. Watch your wake times (time between naps) and make sure they are age appropriate. Also watch baby for clues that they are sleepy (B’s “tell” was rubbing his eyes, then it was tugging his left ear, and now we’re back to eye rubbing) and get them in bed prior to complete exhaustion (otherwise you risk an overtired baby who physically can’t nap). This is another big one-I go by the rule that B’s bed time is 12 hours from when he wakes for the day. Say he woke up at 6:30am- that means bedtime is 6:30pm. Now, not all little ones are going to need a full 12 hours of sleep at night- but they usually need at least 10, so aim for a 10-12 range. And baby bed times are always earlier than adult bed times! Like I said before- babies are not little robots. And all babies sleep differently. The best thing you can do is to not have crazy expectations, be consistent and start a routine. Any changes you make are going to take a few days to become the new routine. And there will be bumps in the road! You would think that they are born knowing how to sleep- wrong!! All you parents out there know what I’m talking about. And all you soon to be parents- you *think* you’ll be able to survive those sleepless nights, but just you wait. Until they occur every night for weeks. And suddenly you’ll do ANYTHING for a full nights sleep. 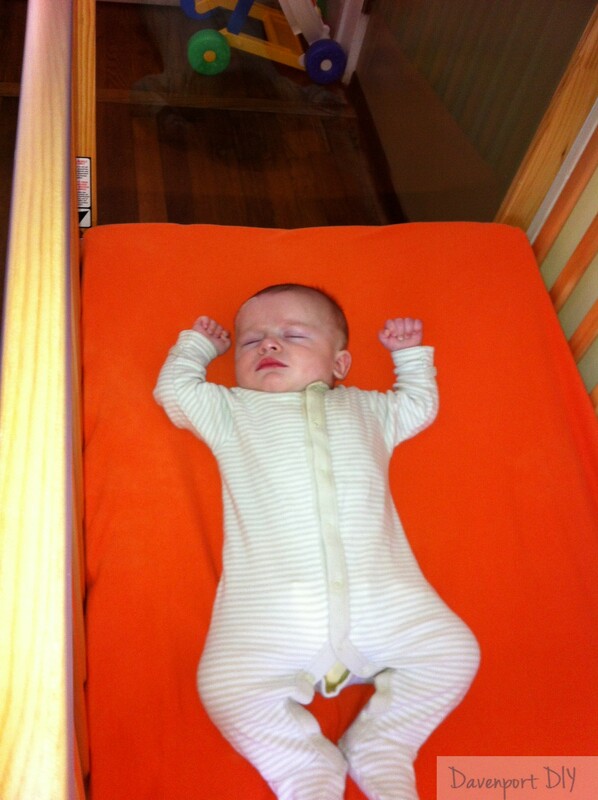 Baby sleep is tough- lots of things interfere with it. When they are new, they wake up every 2-3 hours to eat, and often have night/day confusion. After you get that sorted out, something reflux/gas can interfere with sleep. Then comes teething, baby’s first sickness, the four month sleep regression, wonder weeks, growth spurts, learning new skills like crawling and walking- honestly, it’s amazing they sleep at all sometimes!! There are many schools of thought on how to help your baby learn to sleep- and some people make their living teaching others how to get their baby to sleep. Unfortunately, I have not cracked the “how to get every baby to sleep” code, but I would like to share some tips and tricks that I think are useful for EVERY baby and parent (and this is going to be a 2 part adventure because I am wordy). 1. As soon as you can, establish a sleep routine- and make it brief. Don’t turn it into an hour long ordeal. Ours is: bottle, bath time, brush teeth, pj’s, short song and into the crib awake. It is 30min tops (10-15min is bath time) and it’s the same thing EVERY day. Sometimes I swear our house is like the movie Groundhog Day- even our animals follow a routine. But it works- and everyone knows what to expect! 2. Get rid of any sleep props as soon as you can and put baby down AWAKE! This is a sticky one, but it’s a big one, and something that REALLY helped us with night time wake ups. This means stop nursing to sleep, a bottle to sleep, a pacifier to sleep, rocking to sleep, etc. Don’t get me wrong- I am NOT saying don’t do these things at bed time (and by all means, do them when baby is new- anything to get them to sleep in the beginning). If they work to get baby relaxed- do it! Just don’t use them to put baby fully to sleep. What happens is, they become dependent on these items for sleep. 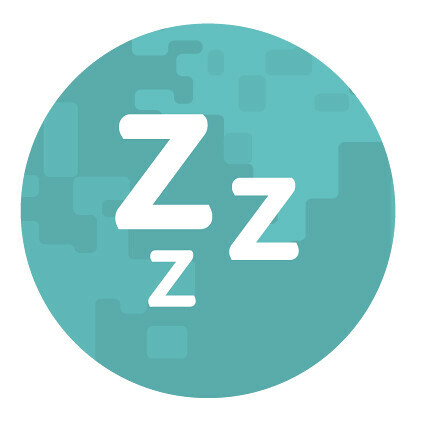 Baby sleep is weird- they cycle in and out of a deep sleep every 30min. When they go into their lighter sleep cycle, they can wake up (adults do this too, but it’s on a longer time frame) and if things aren’t the same as when they fell asleep (crib instead of mom/dad’s arms, not nursing, no pacifier, etc) they wake up, and cry. And then you get the vicious cycle of mom/dad running in to replace the pacifier, or nurse, or rock until they fall asleep, etc. This causes them to become dependent on this sleep prop every time they wake up (which can become every 1-2hrs at an extreme). And sometimes, they just stop sleeping all together, because they are afraid of waking up to a different situation. Think about it- you would too! Say you fell asleep in your bed and woke up on your front porch. You would stop sleeping too, right?? The longer you wait to start putting baby down awake, the harder it is to break their dependence on what helps them get to sleep- and the more they will cry about it when you try to break the habit. We started putting B down relaxed but wide awake around 5mo of age- and he definitely fussed about it in the beginning, but only for a few minutes. 3. Invest in a white noise machine. Turn it up as loud as it will go, even if it sounds completely bizarre to you. We have this one. It is very loud, has 6 different sounds (we use the white noise sound), takes batteries AND plugs in, is lightweight and portable. LOVE it. T and I actually sleep with a white noise machine too- I find I fall asleep faster and sleep better with one! 4. Swaddle- in the beginning (we swaddled until around 4.5 months old). We didn’t swaddle at first (blame it on sleep deprivation) but the first night we did? B slept 7 hours in a row! Amazing. We used these blankets first (along with the sleep sacks I made), and then when B got super strong, we used these sleep sacks. However, once baby can roll from back to front, stop swaddling!! OR, once baby is waking themselves up breaking out of the swaddle- cut it, cold turkey. I recommend going from a swaddle to a wearable blanket if you can, to keep baby warm. This could be considered a sleep prop- but it’s a necessary one at first. Get rid of it when it stops working, and get rid of it quickly. It may take a day or two to get back on track, but baby will adjust!